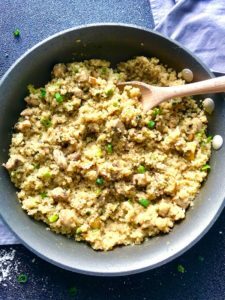 This creamy Parmesan Mushroom Quinoa Risotto is truly one of my all time favorite recipes!! You get the garlic flavor in the background and the nuttiness from the Parmesan combined with the earthy mushrooms. 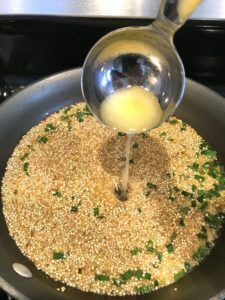 The quinoa soaks up the broth just as rice does so you make it the same way until it becomes creamy deliciousness. This Quinoa Risotto recipe is Gluten Free and Vegetarian. 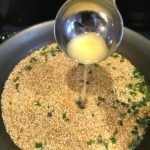 Quinoa Risotto is a Superfood Dish! If you already make Quinoa at home, then you likely know how amazing it is for you. Quinoa, pronounced KEEN-wah, is actually an edible seed. The Incas referred to it as the “mother of all grains” thousands of years back and believed it to be sacred. It started to become trendy around the world a handful of years ago. We now see it show up in a lot of new recipes and it has moved from being a specialty item, to a mainstream grocery store item. I started to cook with quinoa 2 years ago and use it in place of rice or pasta in a variety of dishes. It is gluten-free, so I love that benefit as I look to reduce/cut gluten from my diet. There are so many health benefits with quinoa. First, it is high in protein, which makes it a great addition to any vegetarian dish. 1 Cup of Cooked quinoa has 8g of complete protein containing all nine essential amino acids. Quinoa contains almost twice as much fiber as most other grains – did you know that? That was news to me! Fiber is of course, important for digestion, but also helps reduce high blood pressure, lower cholesterol and lower glucose levels. Quinoa contains Iron, the antioxidant Manganese and Lysine, which is essential for tissue growth and repair. It also is rich in magnesium, which promotes healthy blood sugar control, detoxification, energy production, and the formation of healthy bones and teeth. Last, but not least, Quinoa is high in Riboflavin (B2), which improves energy metabolism. It is seriously a Superfood! 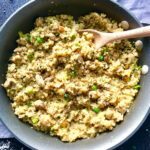 This Quinoa risotto recipe uses broth instead of wine to cook and thicken, while focusing on the flavors from the garlic, parmesan, and mushrooms. I also swapped the heavy cream for low fat milk and you will not miss any of the flavor, I promise! The quinoa soaks up the broth just as rice does so you make it the same way. Ladle in the liquid small amounts at a time. Each time stirring and allowing it to absorb, then adding more until it is perfectly cooked and creamy. 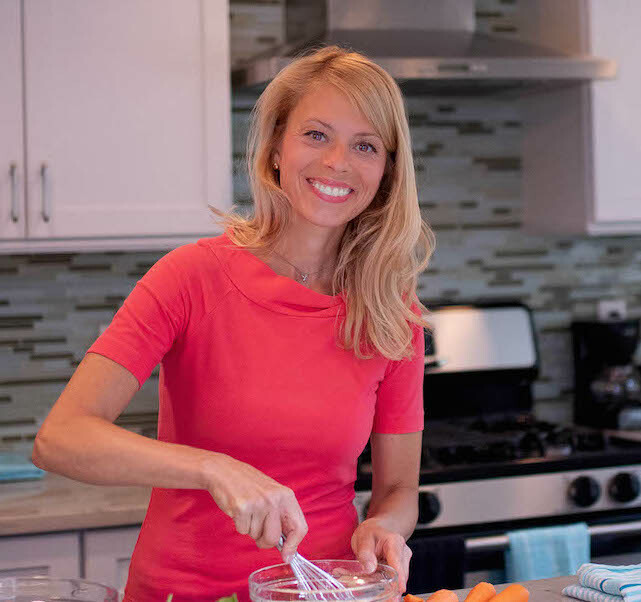 This is really an easy recipe and so good for you. 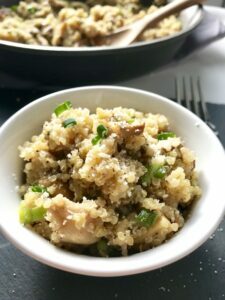 This creamy Parmesan Mushroom Quinoa Risotto is truly one of my all time favorite recipes!! You get the traditional garlic flavor in the background and the nuttiness from the Parmesan combined with the meaty earthy flavor of the mushrooms. The quinoa soaks up the broth just as rice does so you make it the same way until it becomes creamy deliciousness. This recipe is Gluten Free and Vegetarian. Preheat vegetable broth in a pot. Prepare the ingredients for the Quinoa...Slice and then rough shop mushrooms. Slice scallions separating the whites from the greens. Mince 1 clove of garlic. Last, add the remaining scallion greens (save a teaspoon for garnish) and the mushrooms and stir to combine. Add the parmesan and stir to combine. If the parmesan makes it too thick or dry, just add a splash of the broth to make it creamy. Serve and enjoy! 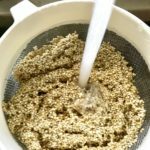 < Previous Weekly Meal Plan: Quinoa, the Supergrain!